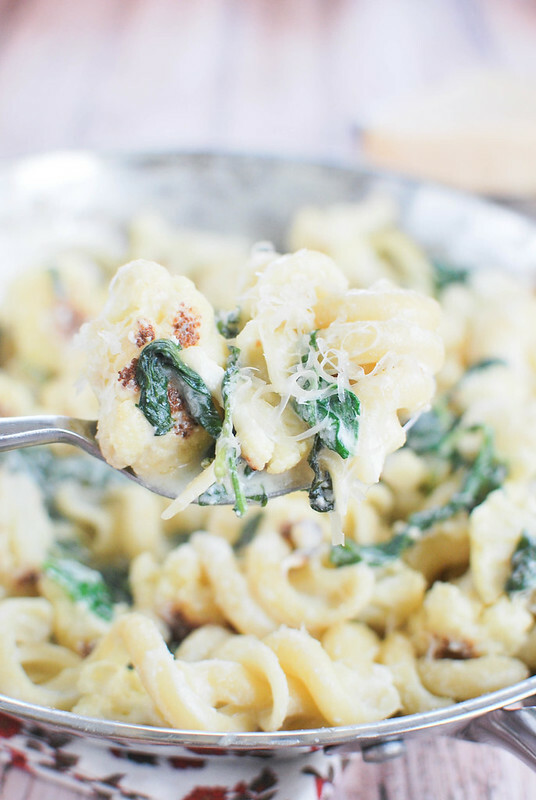 Cheesy Pasta with Roasted Cauliflower – pasta with cauliflower, kale, Parmesan, ricotta, and lemon zest! Light and fresh – perfect for meatless Monday! This is the first of two meatless recipes this week. Things are getting weird. So how was your weekend? Hopefully fabulous! I stupidly scheduled a vet appointment for Clementine at 7:15 yesterday morning. It’s never a good idea to make an appointment that early on a Sunday. Good news though, we only have this week and then it’s SPRING BREAK. And then the kids may or may not go back to school after that. Still waiting for papers to be signed so we know which day we can get the heck out of here. Yesterday I also officially started cleaning out the house. It’s amazing how much stuff you accumulate over the years. I found one of those cell phones with the pull out keyboard in our junk drawer – like, how old is that?! Why do we still have it?! I spent a good portion of the day just filling bags with stuff to either throw away or donate. I’m starting to panic because it just seems like so. much. stuff. and it’s stuff that we’ve just shoved into closets or drawers because we don’t even use it. I need it all out of here! Aaaaand I started listening to The Life-Changing Magic of Tidying Up while I cleaned. Mostly because I’ve heard that the author talks about your socks needing a vacation. My socks and I are pretty excited to hear all about that. Today I wanted to talk about my favorite ways to unwind. I inherited the magazine gene from my mom so I loooooove to settle in with a good magazine. And I have different magazines that I use for different occasions. Like, I buy Real Simple® every month specifically to read at kids’ practices or when I’m waiting in the school pick-up. I picked these up at Target earlier in the month and devoured both of them one night. So relaxing. I also love unwinding in the kitchen. There is nothing better than putting earbuds in, blocking out the rest of the world, and cooking for the fun of it. I love when I have a solid block of a couple hours where I can just cook what I want and then I also love getting the kitchen all cleaned up afterwards. 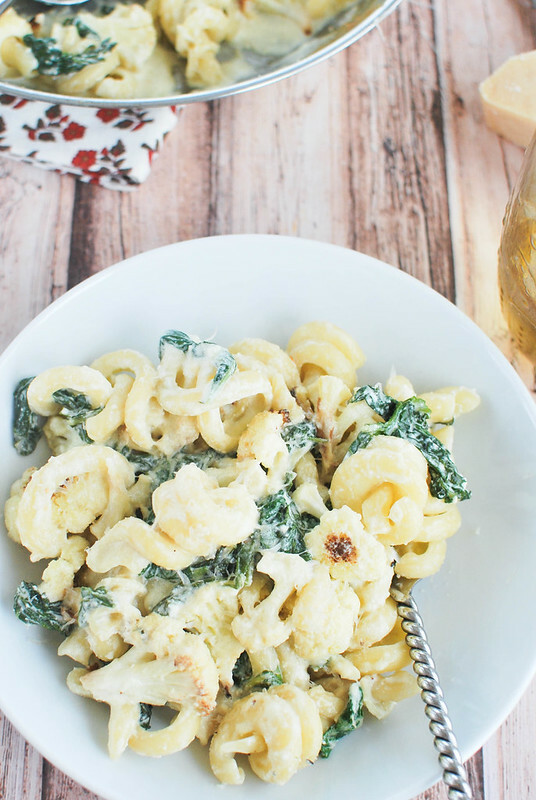 Cheesy Pasta with Roasted Cauliflower! I pulled this recipe from the March issue of All You® and the roasted cauliflower just drew me in. 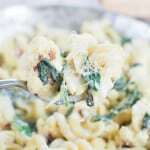 It’s pasta (recipe calls for penne – I have 7 boxes of weird shaped pasta that need to get used in the next couple weeks) with kale and the roasted cauliflower and then it’s all covered in a cheesy cream sauce. With more cheese on top. Roasted cauliflower is just so good. And then you add in two of my faves – kale and Parmesan – and you’ve got a perfect meal! Preheat oven to 400ºF. Bring a pot of salted water to a boil. Line a baking sheet with heavy-duty aluminum foil. On sheet, toss cauliflower with 2 Tbsp. oil and sprinkle with salt. Roast until cauliflower is soft, 15 to 20 minutes, stirring once or twice while cooking. Cook pasta in boiling water until al dente, about 10 minutes or as package label directs. While pasta is cooking, warm remaining 1 Tbsp. oil in a large skillet over medium-high heat. Add garlic and sauté until fragrant, about 30 seconds. Add kale and cook, stirring, until wilted, 1 to 2 minutes. Reduce heat to medium-low and add cream, lemon zest and juice, 1/4 tsp. salt and red pepper, if desired. Cook, stirring, until mixture is just bubbling, about 2 minutes. Drain pasta, reserving 1/2 cup cooking water. Stir pasta into skillet to coat with sauce. Stir in cauliflower, ricotta and Parmesan. If mixture seems dry, stir in reserved cooking water 1 Tbsp. at a time to reach desired consistency. Season with salt and serve. 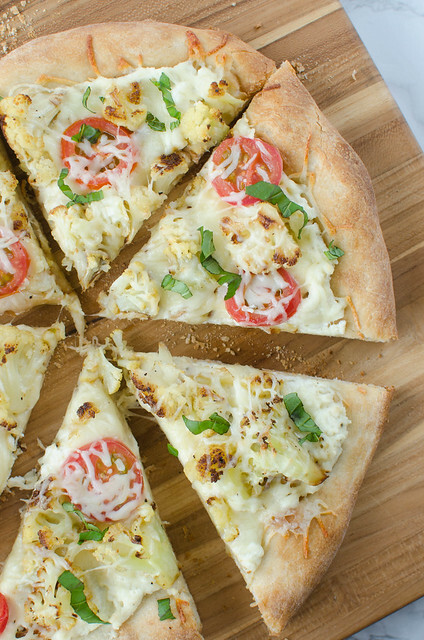 Want more recipes with cauliflower? 16 Responses to "Cheesy Pasta with Roasted Cauliflower"
This sounds amazing. Unwinding with magazines is such a lovely treat. Then making this sort of comfort food? Perfection! What a great way to relax, and that recipe looks delicious. What is it about spring that calls for cleaning?? I tackled our storage room and you can hardly tell. Next time, I’m planning ahead so that I have a delightfully cheesy pasta like this one as my reward! I am a fellow magazine addict.. I have stacks and stacks of them! I need to try this pasta pasta dish, everyone around here loves cauliflower and of course cheesy pasta so this is the perfect marriage! I LOVE roasted cauliflower but I’ve never thought to put it in cheesy pasta! Genius! One of the benefits of a PCS is having a reason to tackle all those piles that accumulate since, oh, about 2 months after you’ve settled into the new place. I tend to accumulate magazines because I’m focused on knitting a blanket. It’s only almost 17 yrs that I’ve been knitting this blanket (but not when my kids were wee little and not when it’s hot out and not at all while we lived in Hawaii–you see how it’s taken me so long). I’m determined to finish it before my youngest heads off to college. I’ve got 3 yrs. I may make it. It’s fun, in a way, trying to use up what’s left in the kitchen. This last move was a first for me–we packed up at one house and unpacked at another less than a week later–so I actually got to move some of the stuff from kitchen to kitchen. Amazing. Back to pasta–this looks so pretty–lovely job on the photos–and I bet the flavor is wonderful. Light, like the light evenings. You say cheese and pasta, I come running. 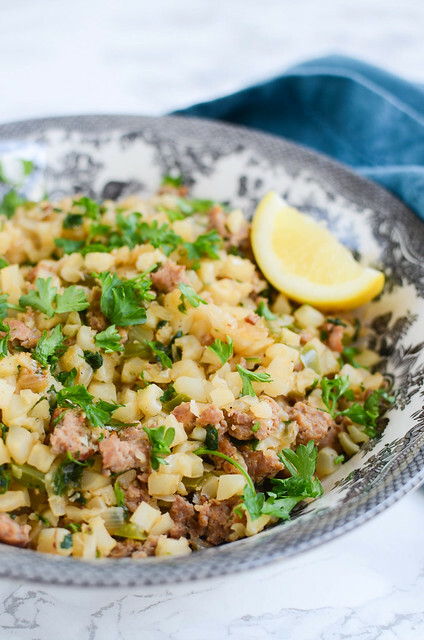 You can never go wrong with this recipe! This sounds like such a wonderful combination! Can’t go wrong with creamy sauces and cauliflower, yum! Mmmmm…cheesy deliciousness! 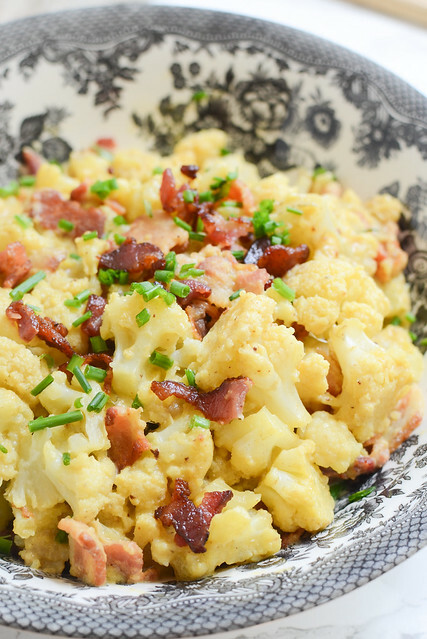 And seriously, roasted cauliflower is the best cauliflower, so this sounds superb! I love to sit down with a good magazine, too (as is referenced by the stray ones laying all over my house….). WHOA! 7:15 is way too early to be up on a Sunday morning! Well, if I had it my way, any morning. But work. Boo. So, now that the pool is 95% done…and it’s 80 degrees here. All I want to do is be outside on my lounger all.day.long. I don’t want to cook, or bake, or write, or…WORK. GAH. 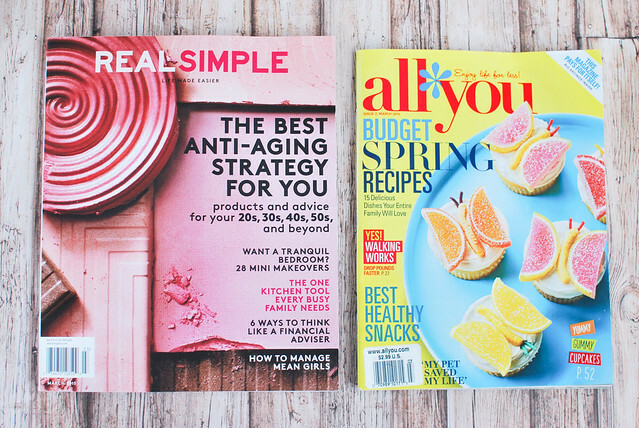 I want to relax and look at magazines. But I have none. I have no mags! I actually sat outside yesterday and flipped through a doll catalog. HELP. Also? I desperately want this cauliflower. It could be 110 degrees outside, and I’d still want it! This looks fab!! I am a huge cauliflower fan but my husband isn’t. Really, he only wants corn. But if I toss cauliflower in with pasta and lots of cheese, maybe I can get him to change him mind! Thanks for the idea! 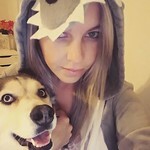 :) Pinning, Stumbling and Yumming! This week I started doing some spring cleaning and was amazed at the amount of “crap” we have hiding every where! Why do we still have all of this if we aren’t using it? My goodwill is going to be so happy to see my loaded down vehicle coming that’s for sure! 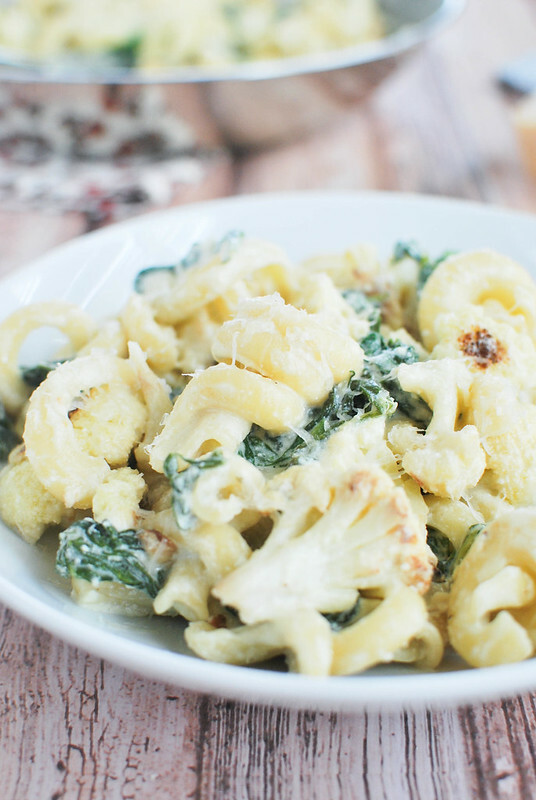 And cheesy pasta with roasted cauliflower sounds like the best way to celebrate our purging!! Yum!